Due to the proximity of the nearly full moon, the sky background may be a problem for the camera at the recommended senseup setting of 8X. If it is too bright, then reduce the senseup setting until things look more or less normal. You can go all the way to 2x and take useable data if you need to. 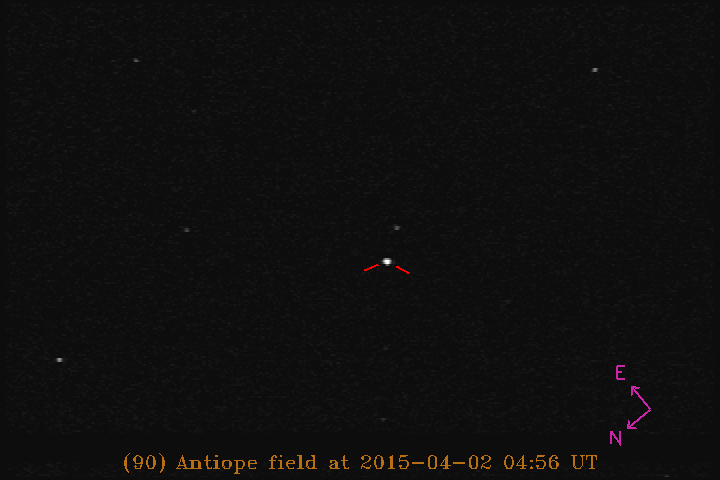 (90) Antiope is a binary asteroid that has been mapped in detail during previous occultation campaigns. 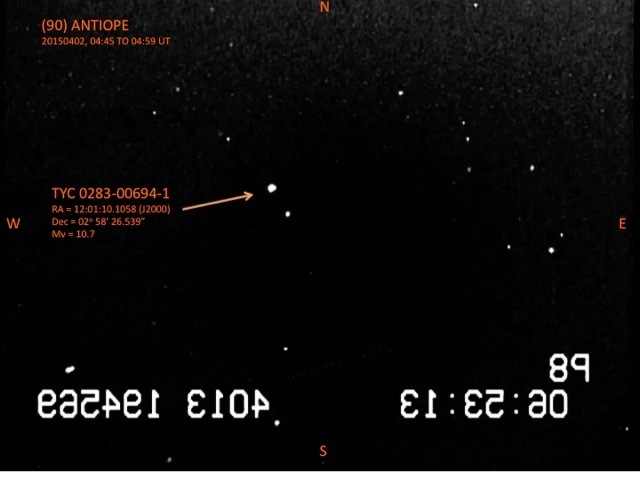 See below for a profile of this object obtained during an occultation campaign on 2011 July 19. The image shows the two components of the double asteroid. Occultation profile of binary asteroid obtained 2011 July 19. Our occultation campaign in April 2015 will contribute useful profile information from a different geometric orientation. The predicted shadow path for this event crosses the pilot RECON Network with the 3-sigma region spanning Tulelake down to Kingman. In addition to contributing data regarding the shape of Antiope, this campaign will serve as an excellent practice campaign for the southern extension of the RECON network which will be trained in the Southern RECON Training Workshop in Kingman Arizona March 19-22. All RECON Teams from Tulelake south to Yuma are expected to participate in the campaign and should sign up for the event on Occult Watcher. Either before or after the event, you should make a short recording of your position information using the switch on the front of the IOTA-VTI box. Adjust the switch to POSITION, record the screen showing your latitude/longitude for 3-5 seconds, and then adjust the switch back to TIME. Note that the last star in the list is the star to be occulted. I left it in as a reminder that the star magnitudes we use aren’t always consistent between different catalogs as is in this case. Watch out for the very first star on the list. If you are getting on the field really early you might not be able to start here. The star, 7 Vir, works very well as a first test star. Working through this training set will be very important for this event due to the nearby nearly full moon. You may not see anything other than the target star when you get to the field. 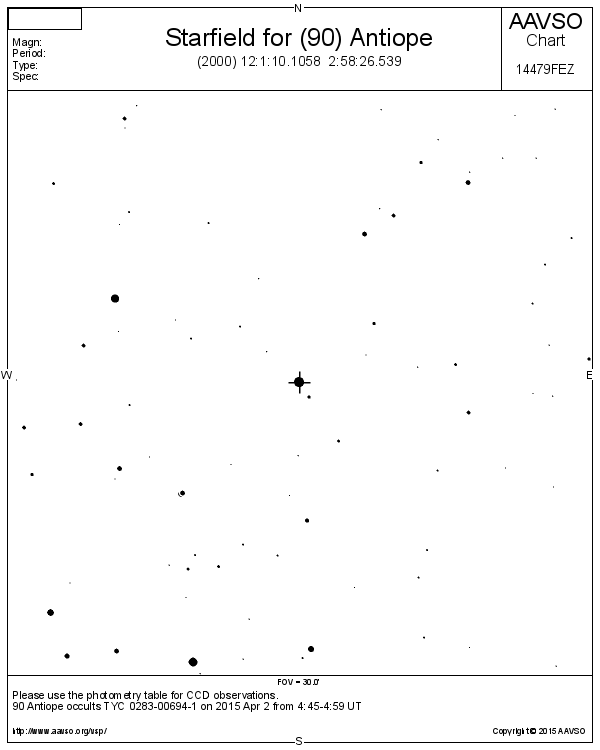 The following chart was generated using the AAVSO Variable Star Plotter. Note that we have changed the orientation of the map so that it will match what you will see using the MallinCAM connected to the telescope with a diagonal. For the remainder of the project, we intend to provide star charts using this orientation. Note also that this is a sparse star field with few stars in the immediate proximity of the target star. This, in addition to the fact that the nearly full moon will be only 13 degrees away, will make positively identifying the star field challenging. We recommend using the starhop technique and also note that there is a recognizable double star to the southwest of the target star. The following star field image was provided by Bill Gimple from Greenville, California. Additional images are welcome! Here’s another version without any rotation but with hot pixels removed. This was taken by Marc Buie about 9pm MST on 2015 March 16. This is the native orientation of the image. It has been processed to remove hot pixels. The image was taken with a SENSEUP ov 128x to bring out the field stars for field confirmation. With a little more processing, here is the same image rotated and stretched to bring out the faintest stars. 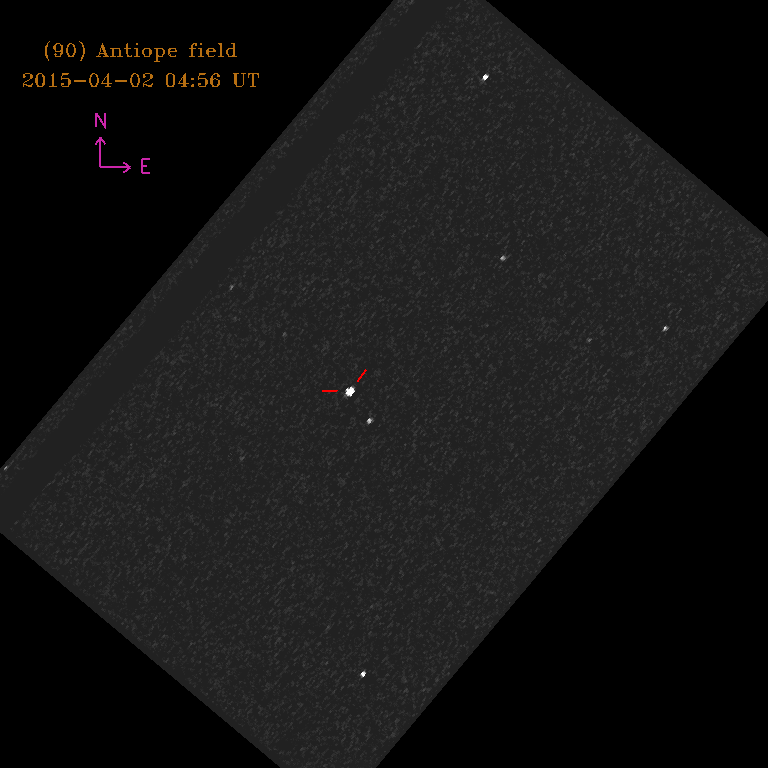 This is an image of the field where (90) Anitope will be on 2015 April 2 UT. It has been rotated to put north up. The field parity is still flipped, due to use of the diagonal. The image has also been stretched to make the sky more apparent and bring out the faintest stars. Did not get to record event last night. Technical difficulties. We are working on a technical problem solving guide to assist whomever is in the field. Keeping a log book of problems as the arise and what we found useful with our telescope. Had some students come out and that was nice to see them excited!